Step2 Lifestyle Fresh Accents Kitchen $59 Shipped v $89.99 – Rare! Amazon.com Price: $67.17 (as of 2019-04-25 14:03:13 GMT) Product prices and availability are accurate as of the date/time indicated and are subject to change. Any price and availability information displayed on Amazon.com at the time of purchase will apply to the purchase of this product. Fun-size kitchen perfect for any space. Includes a 30-piece accessory set that allows hours of play. Sounds for microwave, stove and phone. 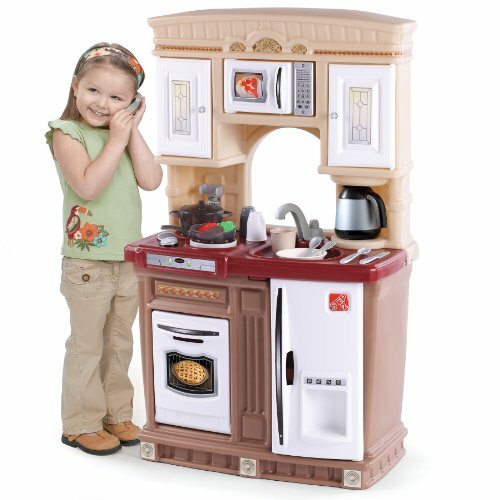 Stylish kitchen with “window” for loads of imaginative play. Special frying pan and boiling pot with lid activate electronic frying and boiling water sounds in stove’s front burner. Includes coffee pot with molded-in coffee maker. Features “stainless steel” microwave, refrigerator and oven. Heat up the fun with the microwave’s electronic key pad. Includes 30-piece accessory set (accessories may vary): electronic phone, 10-pc play food set, pot and pan w/ lids, dishes, bowls, silverware, and salt and pepper shakers. Note: Refer the Specification Sheet given on Technical Specification for Components details. Save on Martha Stewart Living Magazine! Mickey Mouse Face Shape Cookie Cutter $1.28 Shipped!